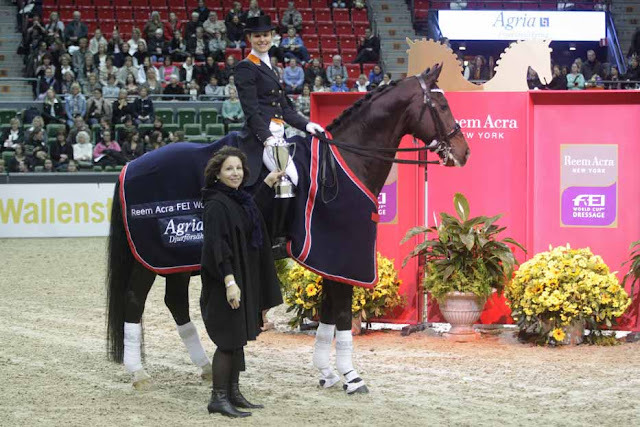 The Netherlands' Adelinde Cornelissen, pictured with Lisa Wells of Reem Acra, secured her fourth victory in the 2010/2011 Reem Acra FEI World Cup™ Dressage series at Gothenburg, Sweden today. Photo: Roland Thunholm/FEI. Adelinde Cornelissen and Jerich Parzival recorded their fourth victory of the 2010/2011 Reem Acra FEI World Cup™ Dressage season at Gothenburg, Sweden tonight and jumped to the top of the Western European League leaderboard ahead of the final qualifier on their home turf at 's-Hertogenbosch, The Netherlands in three weeks' time. The 32 year old rider and her 14 year old horse produced a more harmonious test than ever before, and Cornelissen declared herself delighted with the result. Sweden's Patrik Kittel finished a close second however with a personal-best result from his stallion Watermill Scandic HBC while Germany's Isabell Werth and Warum Nicht FRH had to settle for third. In a competition that was very much "a game of two halves", many of the early riders produced low scores. Ground Jury President, The Netherlands' Wim Ernes, said "tonight we saw some bad tests....but the top riders did a good job". He added "we saw today in the first group, a lot of riders who did not have enough impulsion and so made a lot of mistakes". Sweden's Rose Mathisen and Bocelli, fifth to go of the 15 starters, were the first to break the 70% barrier with a score of 70.225 which still held the lead at the halfway stage. And, as the competition resumed, they remained out in front when Belgium's Marc Peter Spahn and his Friesian stallion put 68.450 on the board. Next in was Denmark's Andreas Helgstrand however, who raised the bar with a score of 72.525 riding the nine year old mare Polka Hit Nexen. This partnership impressed the Ground Jury - "this is a young horse and there were problems with temperament but there were also some real highlights - the scores ranged from 9's to low marks as a result" Wim Ernes explained. Two horses later, Cornelissen and Parzival brought a whole new dimension to the competition with a score of 82.875. Despite the close proximity of the spectators, the big chestnut gelding who has so often been fazed by the crowds remained focused and free-moving to produce sparkling piaffe and pirouettes that were perfectly balanced and light. This was a test that oozed confidence, and as they executed their final movements you could hear the intake of breath from the audience who knew they were watching something special. Kittel then put 81.025 on the board with a performance that surprised even himself. "I got a score of over 80.00 - it's something I've only ever dreamed about, and it's just amazing to do my personal best here in Gothenburg!" he said with a big smile. "The atmosphere was very intense and he was on his toes but I was super-happy with a lot of his stuff!" he added. Dutch rider Jenny Schreven followed him into the arena for a mark of 72.900 and this proved good enough for fourth place in the final analysis. Wim Ernes was most impressed with the work the 25 year old produced from the veteran, Krawall. "This is an old horse - I believe he is 19, and it's amazing that he can still perform like this - I think he is enjoying a second youth, and she (Jenny Schreven) is a real talent. She's young and its very nice to see her ride like this - she did a good job yesterday and today" he pointed out. America's Catherine Haddad and Winyamaro scored 70.650 when second-last to go and now only Werth and Warum Nicht stood between Cornelissen and her fourth win of the season. Punished for some mistakes however, the German duo's mark of 79.775 would not present a major threat. Werth didn't seem disappointed afterwards. "I was quite satisfied. We did better canter-work and my horse was more relaxed but we did have a little mistake in the half-pass" she pointed out. Cornelissen explained that her biggest battle tonight was with her own health because she had been feeling ill since winning Friday night's Grand Prix. She said however that she was disappointed with the points she received for tonight's test - "at the Europeans I scored 86.000 yet this was a better test and I only got 82.000 - maybe the judge can explain?" she said looking at Mr Ernes. He replied that she had done "a very good test" but that "sometimes the horse was a little short in the neck - but it was a good total picture" he explained. Cornelissen now heads for the last qualifier in the 10-leg Western European League season at 's-Hertogenbosch at the end of March but is under no pressure ahead of the final in Leipzig, Germany having proven her form by adding the Gothenburg trophy to the ones she claimed earlier in the season at Stockholm, London and Amsterdam. She now tops the Western European League table with a three-point advantage over Germany's Ulla Salzgeber in second and has a six-point lead over third-placed Werth. 15, Lomumba Havdal (Per Sandgaard) SWE 66.850. Today's competition at Gothenburg, Sweden was the ninth qualifying leg in the 2010/2011 Reem Acra FEI World Cup™ Dressage Western European League series. Just one further qualifier will take place, at 's-Hertogenbosch, The Netherlands from 25-27 March, before the final in Leipzig, Germany 27 April to 1 May. This was the fourth victory in the current series for The Netherlands' Adelinde Cornelissen and Jerich Parzival. They now head the Western European League table with 80 points ahead of Germany's Ulla Salzgeber (77) in second and Isabell Werth (74) in third. The Ground Jury for today's competition consisted of the following members : At E - Mrs Maria Colliander FIN; At H, Dr Wojtek Markowski POL; At C, Mr Wim Ernes NED; At M - Mr Gustaf Svalling SWE; At B, Mrs Annette Fransen-Jacobaeus SWE. The oldest horse in today's competition was the 19 year old Krawall ridden by The Netherlands' Jenny Schreven. Krawall finished fourth for the Dutch rider in Friday's Grand Prix which was won by The Netherlands' Adelinde Cornelissen and Jerich Parzival. The youngest horse in today's competition was the 9 year old bay mare Polka Hit Nexen, competed by Denmark's Andreas Helgstrand. The oldest rider in today's competition was 74 year old Ulla Hakanson from Sweden while the youngest rider was Norwegian 23 year old Lillann Jebsen - an age difference of 51 years between the two ladies! On Friday, the FEI announced the creation of sa lead judging post, entitle Dressage Judge General, to ensure greater consistency and accuracy of judging at all levels of Dressage competition and Ghislain Fouarge (NED) became the first appointee. The first term of office for the Dressage Judge General will be two years, and the position will always be filled by a 5* judge. The FEI has also appointed Eric Lette (SWE), David Hunt (GBR) and Dieter Schuele (GER) to the Judges Supervisory Panel (JSP). Adelinde Cornelissen - "Parzival is getting much more relaxed in the arena - now he likes the audience and the applause and the attention so the whole picture is getting better". Wim Ernes - "It is important at Grand Prix level that a horse carries himself". Patrick Kittel, when asked if he thought he could improve his performance enough to beat Adelinde Cornellisen - "you never think like that, you just think about getting better, what you can change and what you can do better"
Patrick Kittel, when asked if he would be attending the last qualifying leg at 's-Hertogenbosch - "my wife's sister is getting married in Australia at that time so I won't be going".